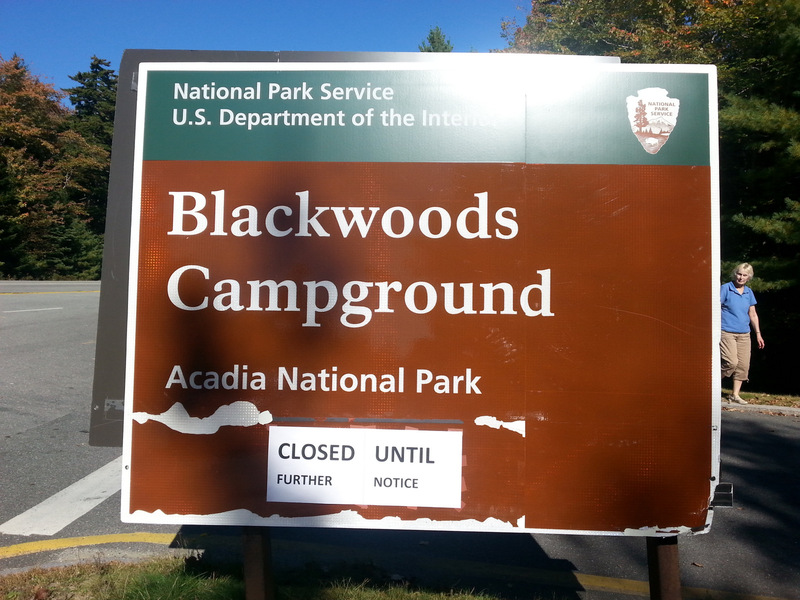 We rolled into Acadia on the day of the government shutdown, not knowing what to expect. Would our reservations for four night be honored? (no). But, we were allowed to spend two nights in the Blackwoods Campground, with a promise that our other two prepaid nights would be refunded. While the sites here are not spacious, they are somewhat protected from each other, and there are very few campers here. All the bathrooms except one have been closed. It’s a cold-water bathroom only, no showers. But, hey – that’s not why we came to this campground. 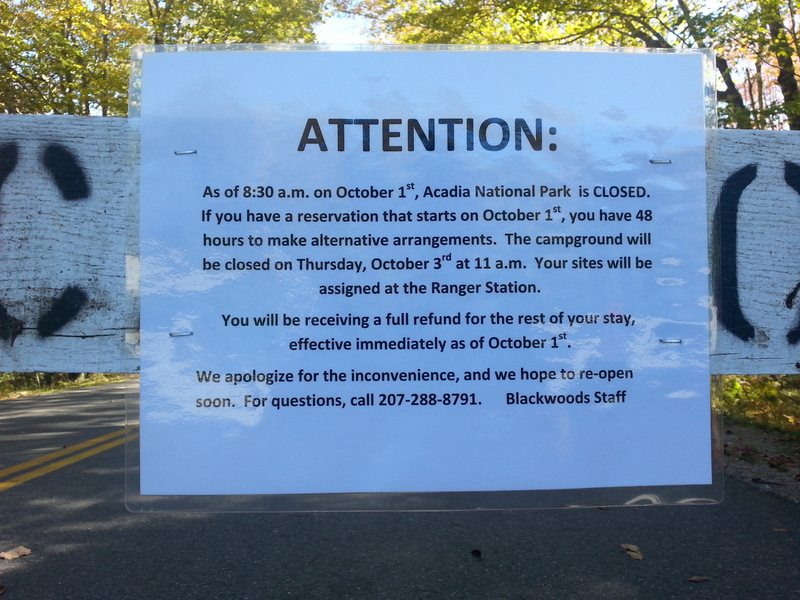 At check-in, the Ranger told us she wasn’t going to give us any hiking maps or park maps, since the park is closed. We asked about going in on foot or bicycle, and were told, pretty emphatically “NO”. But, in looking at the campground map, we noticed that the South Trail to Mt. Cadillac goes off the distant end of the campground. Who would know if we were to sneak back there for a hike? 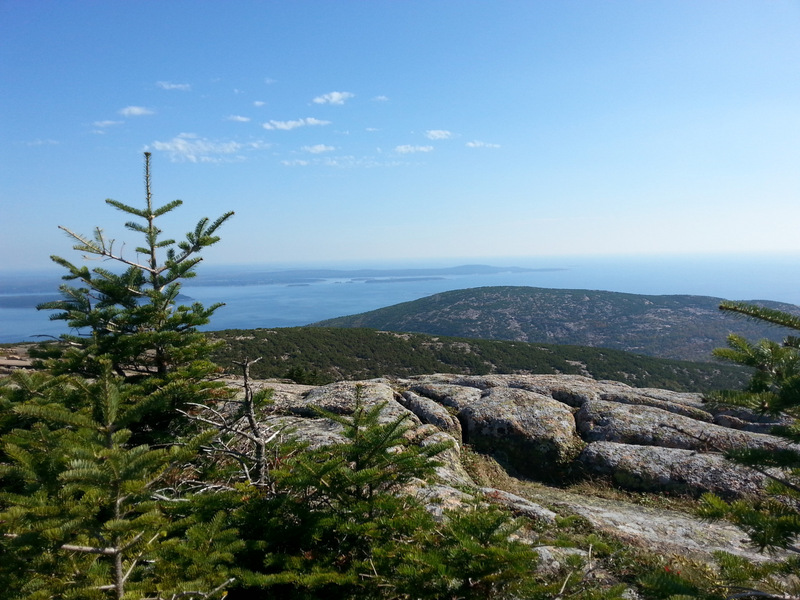 This particular hike was on our radar for one of the prime activities we were looking for in Acadia, so we decided to go for it. Wednesday morning, we leashed Jezzy up, grabbed a couple litres of water, two dog biscuits, and two Clif Bars and headed on our stealth hike. WOW! Of course, we weren’t the only folks there. We did pass a few cyclists on the road, and a couple dozen hikers either going up or down. 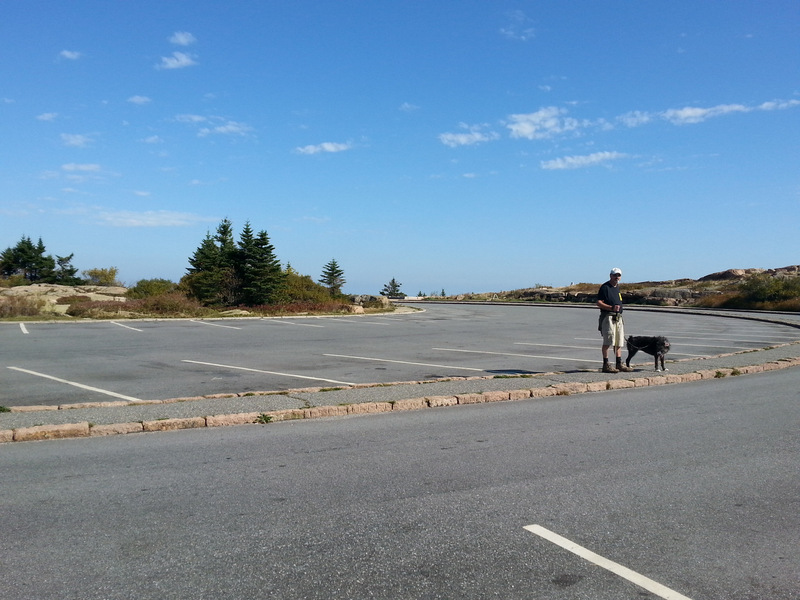 Eerie at the top where we strolled thru a parking lot void of any cars. A hikers paradise. The hike was longer than we anticipated. From the rudimentary map we had, we anticipated that it would be about 5 miles round trip. In fact, it was about 8-1/2 miles. The trail itself was wonderful – a mixture of bare granite dry rock at the top, and mossy, rock and root footpath near the bottom . About halfway to the top, the wind began to really howl – it was hot, and we appreciated it, but did have to hang on to our hats for fear of losing them. The hike was worth our tired bodies and sore feet. As soon as we got back to the campsite, Jezzy crawled under the Fireball into the shade. She’s had enough hiking for a week, thankyouverymuch. How to reward ourselves for such a great day? Showers and lobster! We elected to visit the coin-op shower near the campground instead of using our tiny T@DA shower. 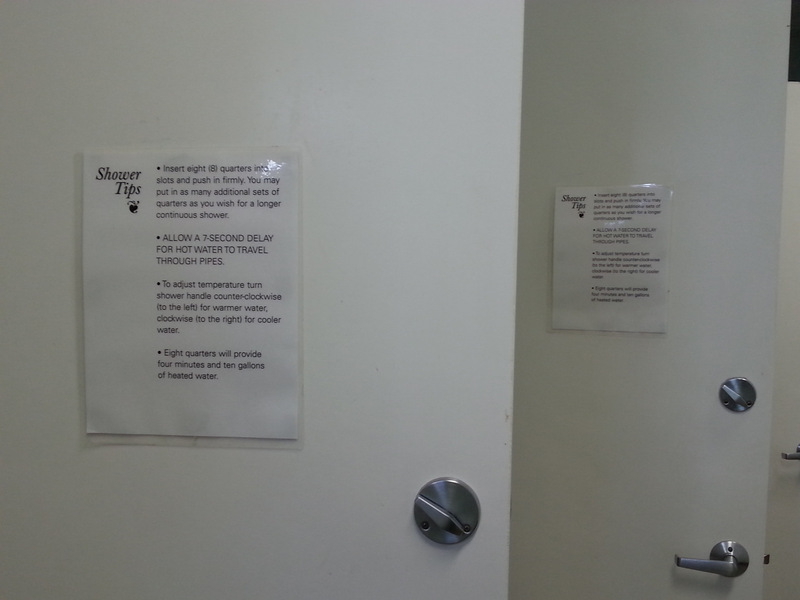 We like to use our shower, but find that it is difficult to reduce the humidity level in the T@DA once we have used it. We do dry off the walls in our tiny bathroom, but there’s no good place to hang towels (outside at night, they just get wetter), and the bathroom itself has no ventilation. Good in a pinch, but we usually opt for another shower if one if available. So, coin-op it was. A great shower for $2 each – four minutes of hot water and we could actually turn around inside the shower. Wonderful. 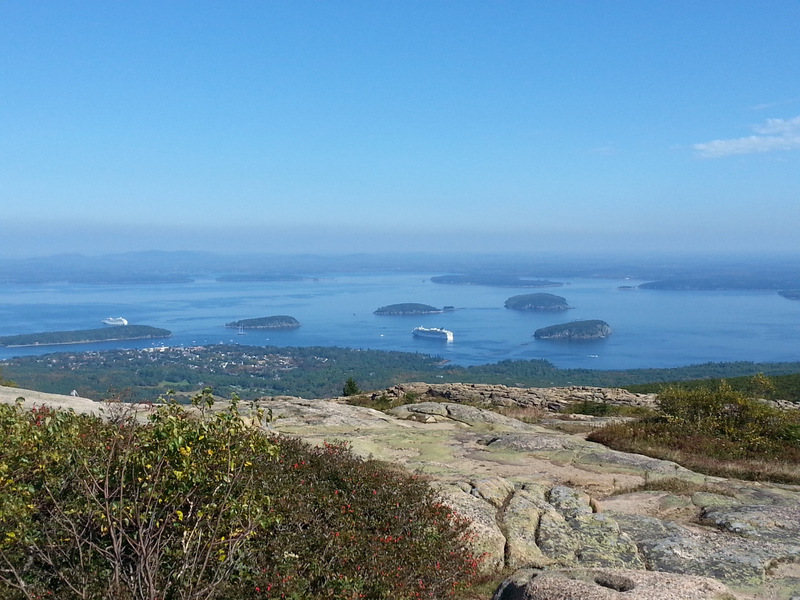 Our bodies restored, we rolled into Bar Harbor in search of lobster. 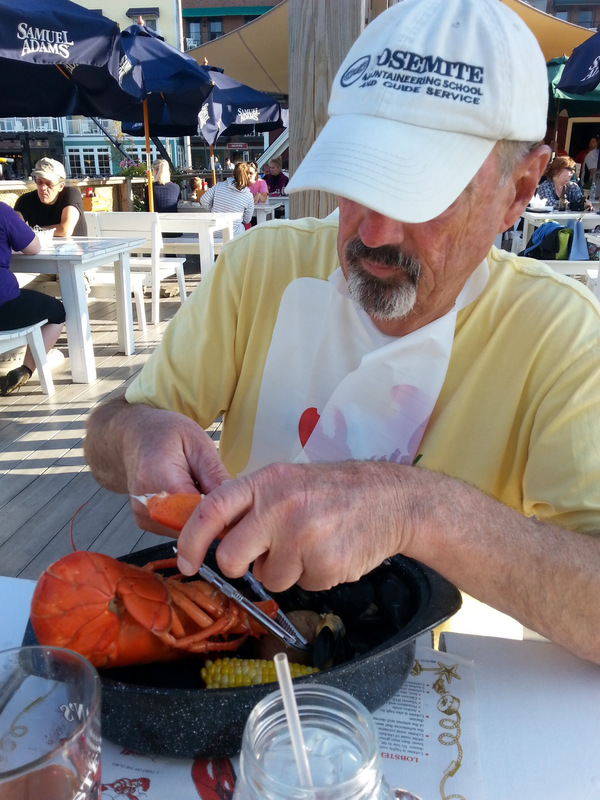 John elected to gorge on the Lobster Experience – a whole lobster, clam chowder, potato, corn, and about eight steamed mussels. He tucked into that dinner like a starving man (which he probably was). 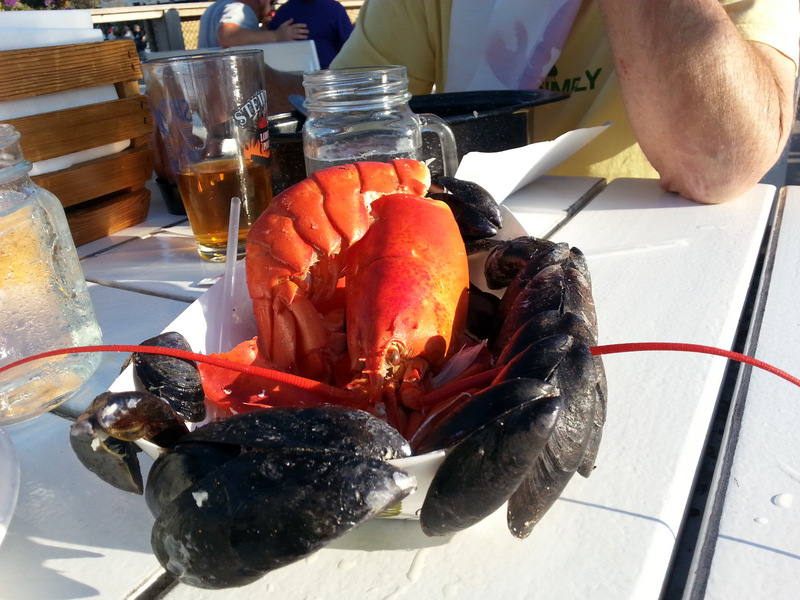 I had some pretty ho-hum lobster stew. A beer each, and we were civil once again, and could speak in complete sentences! Now its Thurday evening – much has changed. 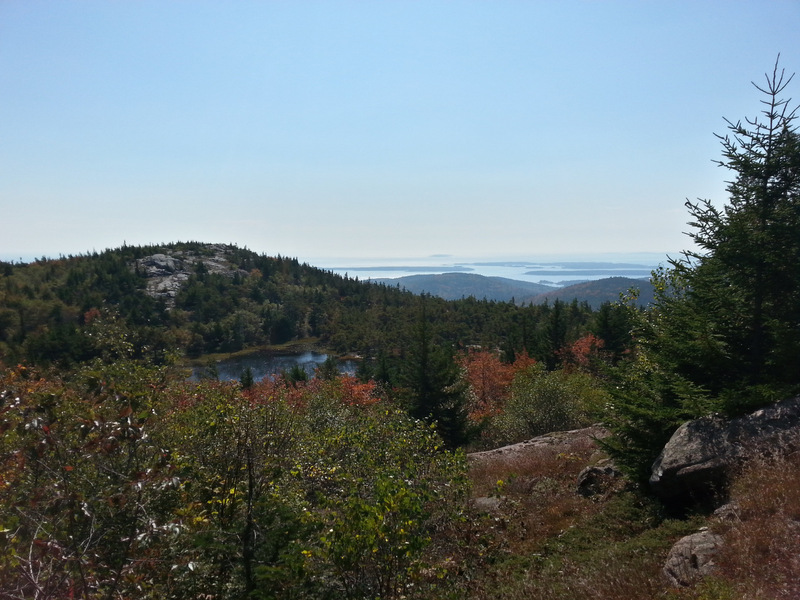 New post coming, but we’re still near Acadia! 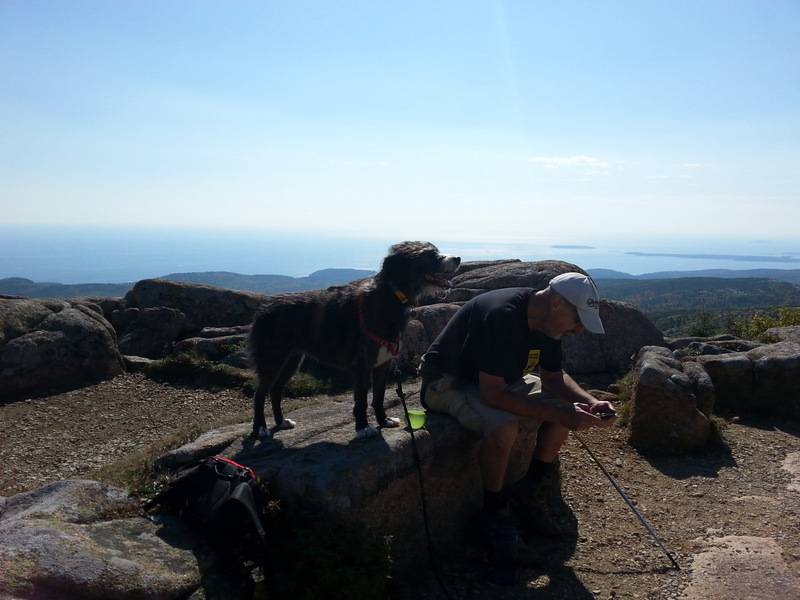 This entry was posted in camping, great outdoors, hiking, Maine, national parks, retirement, simple camping and tagged camping, dogs, hiking, historic sites, Maine, national parks, retirement, road trip, simple camping, the great outdoors by Judy Crankshaw. Bookmark the permalink. It sounds as if you’re enjoying yourself despite the difficulties you’re facing.